New research in Scientific Reports indicates there may be a health hazard from tattoos that has not previously been observed. 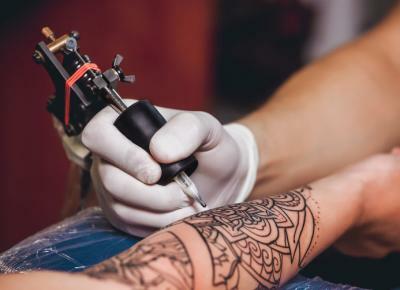 It seems researchers have found high levels of metals circulating in the body and concentrating in the lymph nodes that can be traced back to tattoos. Under the research, scientists observed stained lymph nodes in two tattooed cadavers and found heightened levels of several metals, including toxic mercury in one of them. The next step is to study the actual health effects of this residual ink from tattoos. Community bankers don't need to get tattoos to feel the potentially toxic effects of cyber issues. Malware threats present a dual concern: bankers are concerned for their own security hygiene and they are also concerned for their business customers. In fact, small- and mid-sized businesses (SMBs) experienced as much as a 500% increase in ransomware in March 2017 alone (over the previous year), according to research from Malwarebytes. Overall, SMBs experienced 165% more malware in 1Q 2017 than they did in 1Q 2016. Total malware incidents more than doubled in that time in 40 states, according to the same study. But, the massive surge in ransomware schemes alone did not account for all the SMB security attacks. Traditional adware attacks also continued, with 33 new adware variants emerging by 1Q 2017; and new variants of old malware replaced traditional adware, as cyber-criminals upped their game. According to the FBI, about 4000 ransomware attacks occurred every day in 2016. This is disconcerting for community banks because SMB customers are more likely than their larger counterparts to be breached. A June 2016 study from Keeper Security and Ponemon finds more than 50% of SMBs were breached in the past year. Why SMBs? According to research from Ponemon, 58% of such businesses still do not consider cybercrime a big risk to their organization. Further, 44% do not consider strong security a priority. This is despite the fact that the cost of a data breach jumped from $3.8mm in 2015 to $4.0mm in 2016. Another reason cybercriminals target SMBs is that about 66% globally do not even have a data security policy, according to FireEye research. Many SMBs seem to believe they cannot afford the "layered... or defense in depth security." Still another issue is that the United Nations Office on Drugs and Crime finds only about 10% of cybercrimes reported to police by SMBs result in a conviction. Knowing this, community bankers should communicate regularly with business customers on the risks of malware and other cyberattacks. A clear and high level of communication not only helps them, but also your bank. After all, an infected customer can spread viruses quickly. A FireEye white paper on the topic finds that "advanced malware typically resides in infected systems for weeks, even months, before common security tools detect it." Maybe your grandparents were right when they told you an ounce of prevention is worth a pound of cure. Stay cyber-healthy out there and watch out for sharp needles along the way. Yields slipped 3bp as investors focused on the escalating tensions with North Korea and Germany's far right party making gains in the latest election. Schwab reports 60% of their robo advisor clients are baby boomers or older and 15% have combined assets of $1mm or more. Deutsche Bank research into the source of the next financial crisis flags the following as higher risk: the "Great Unwind" of quantitative easing by the Fed, ECB and BOE; central banks being out of ammunition to respond; potential crises in China; potential crises in Italy; elevated global trade imbalances; high debt levels; a populist political surge; multi-century all-time lows in interest rates; valuations in many different asset classes; more quantitative easing if inflation does not reignite; Brexit; a lack of financial market liquidity. According to FIG Partners, the reported value of overall US banking deals has increased around 5% from this time last year. While there are over 2mm mortgaged properties in Irma disaster areas, which equates to 4x greater than that of Katrina and 2x greater than that of Harvey, Irma was a different type of storm so the type of damage will be different and possibly more difficult to quantify. The SEC has hit SunTrust Investment Services with a cease and desist order, ordered it to refund $1.3mm in overcharged fees to clients and fined it $1.1mm. The SEC says SunTrust breached its fiduciary duty by making improper investment recommendations to clients when it purchased mutual fund share classes that charge fees and failed to inform customers that there were share classes without fees available. A CNBC poll of economists, fund managers and strategists finds 68% think the Fed will begin unwinding its $4.5T balance sheet in Oct. The first $2T is expected to take about 4.4Ys to wind down. The bank customer relationship is still important as customers are shifting toward digital banks only in single-digits in many markets, according to Accenture. An ABA Payments Strategy Survey of banks finds 71% said they don't capture or analyze payments data. Of the 29% that do, 88% use the data for fraud detection and 96% use it for tracking activity volume.